For many people, Florida means Disney World, warm weather, the ocean, and vacation. For me it means heat, humidity, unsavory little critters, and complications. Pressing family issues have landed me in Florida. Rearranging my schedule, booking a flight, packing, and arriving in Florida have left my mind in a muddle. I left the Madison airport at 5:45 AM. (What was I thinking?) It took me to Detroit. Then it was on to Atlanta and finally to Daytona Beach – a full day of travel. This would have been an excellent time to pay that extra twenty-five dollars the airline charges and check my luggage instead of wheeling it around four different airports and realizing I have to work on my upper body strength in order to squeeze it into the overhead bins. Post-it reminder: Pay the darn $25 and check luggage on the way home. When I left home, it was chilly. Some might even say it was cold. I packed accordingly. Now that I’m here, I’m peeling off layers of the wrong clothes I brought. In the heat of the frenzied moment of packing, I forgot to remember that Florida is always warm, and no matter what the temperature might be, my dad always keeps his house at eighty degrees. I don’t think our thermostat goes that high! It’s great to see my dad and help him out, but I’m here for too, too many days. Doesn’t anyone remember the wisdom of Ben Franklin when he said, “Fish and visitors stink after three days?” If this heat keeps up, I’ll be stinking well before then. I’m doing what I’m supposed to do, and I have a smile on my face. Before embarking on my unscheduled getaway, I quickly composed a list of things for my husband to do – just in case he is missing me too much and wants to surprise me when I get home. I realize it was probably an exercise in futility, but who knows – miracles do happen. Unexpected news has sent me flying off the broom handle. Today I’ll be blogging in the wind…. Nature has a way of inspiring us in the most unexpected ways. The sky has an eerie glow. 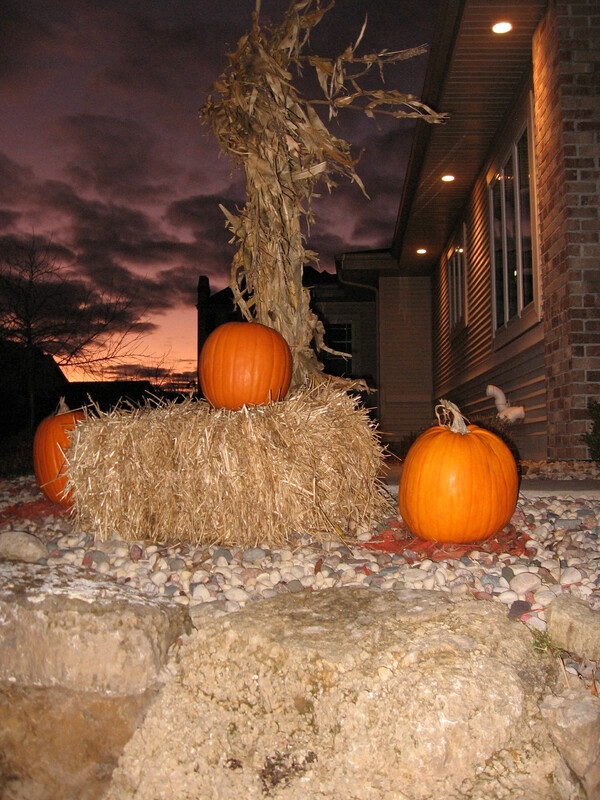 The cornstalks are rustling in the wind. There is a hint of mystery in the air. What lurks behind the bale of hay? Only the shadow knows. This picture may not be worth a thousand words, but it could be worth five hundred words in a picture book. Are you inspired? 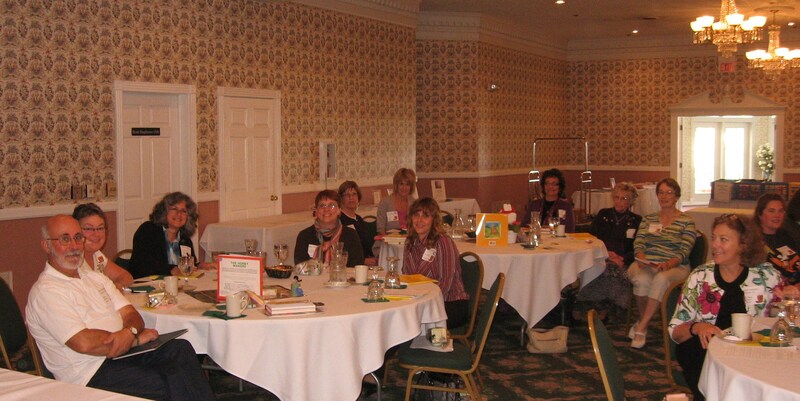 The SCBWI-Wisconsin Fall Retreat was fantastic. Who cares that we stayed in a retirement home for nuns with austere rooms and bathrooms reminiscent of old college dorms. It was all about the people who were there – the speakers and the attendees. It was a Shake, Rattle and Revise weekend ─ a time to learn how to strengthen our writing craft and a time to mix and mingle with some very knowledgeable and talented people. 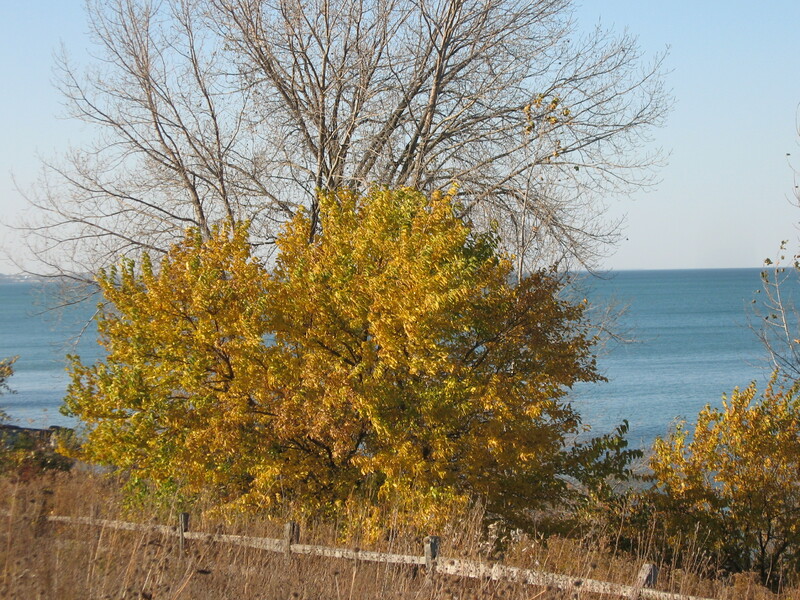 And if that wasn’t enough, the “Sweets Table” was to die for and take a look at these views of Lake Michigan! Bruce Hale, author of the Chet Gecko series and other books, kept us in suspense as to which hat he might wear next. Editors, Lisa Yoskowitz (Dutton) and Greg Ferguson (Egmont USA), gave us insights into the submissions process, marketing ourselves, and the editorial process. Mary Kole, an agent with the Andrea Brown Literary Agency, talked about what we need to do to get an agent. Loraine Joyner, art director at Peachtree Publishers, walked us through the steps an illustrator takes to reach the finished product. Finally, author Deborah Wiles made us laugh and made us cry with tales from her personal life and from her life as a writer. Each presenter left us with food for thought. They were equally as appealing as the “Sweets Table.” Could any writer ask for more? Well, we got more! Our own talented members offered breakout sessions on point of view, writing to foster emotional growth, uncovering the secrets of finding the right agent, writing a one-page synopsis, and revising with fierceness. There were also peer group critiques and individual critiques from visiting faculty and our own published authors. This was a weekend not to be missed. When an opportunity to go to a writing conference presents itself, don’t think twice – GO! You never know what pearls of wisdom you can add to your hope chest of writing! 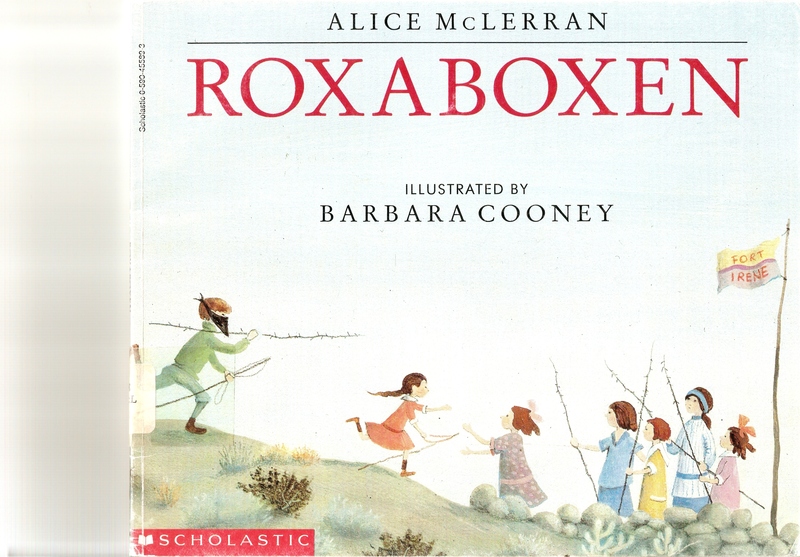 Imagination abounds in Roxaboxen, a picture book written by Alice McLerran and illustrated by Barbara Cooney. It’s a perfect example of how children, with time for free play, can come together to create a magical world of their own. From the opening pages, McLerran and Cooney take us back in time to an imaginary place conceived by a group of children. Simple objects take on a new purpose in the imaginary town of Roxaboxen. Pebbles become money. 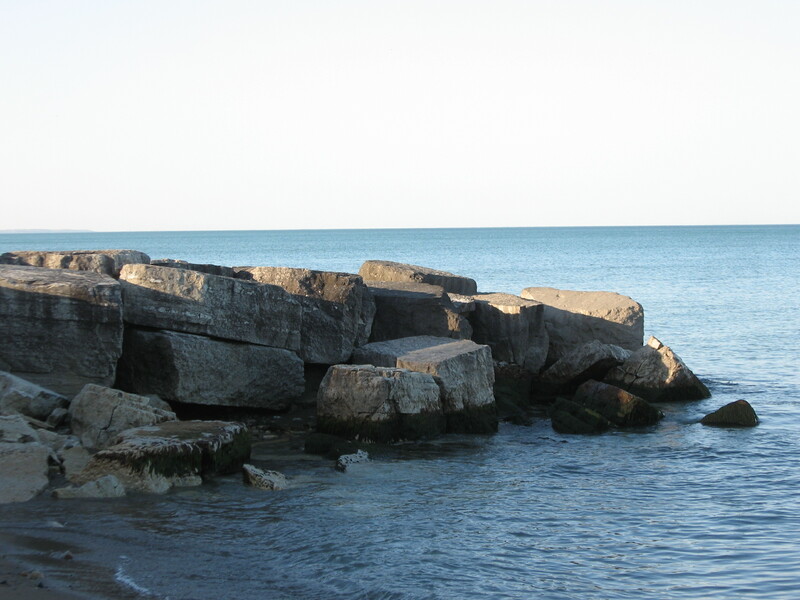 White rocks define streets and houses. Boxes become shelves and tables. A round object becomes the steering wheel for a car, and a long stick becomes a horse. There is a mayor, a policeman, a baker, and an ice cream maker. Everyone plays an integral part in the fantasy world they have created. I admit one of the many reasons I like this book is because it reminds me of when I was growing up. Special moments spent when we are young are moments we may remember, but never recapture once we’ve grown. That’s why this book tugs on my heartstrings. Roxaboxen is a great book to share with children to encourage them to use their imaginations and experience a sense of euphoria as they celebrate magical moments. Last Friday I attended the Wisconsin Catholic Library Association Conference (WCLA) where I was also a guest speaker. The day was packed with giveaways and information. We were greeted at the door by Elizabeth Fixmer, who signed and gave away copies of her wonderful new book, Saint Training. The first presenter of the morning was Merri Lindgren, a librarian from the Cooperative Children’s Book Center. She gave us a peek into the preliminary list of books published in 2010 that have been selected for inclusion in the CCBC Choices 2011. Merri noted that it’s possible that a few titles might be removed after a final review. Merri did a wonderful job of presenting books from different categories and building interest and excitement about the books. Below I have listed a few favorites that I would like to add to my school library. After Merri Lindgren’s fantastic presentation, it was my turn. It’s so not easy to follow someone who has done a wonderful job of capturing the audience’s attention, but with a lovely introduction by Sharon Hart Addy, I was off and running at the mouth! My talk was “The New Look of Today’s Authors.” I spoke about online presence of authors, competition in the publishing field, and continuing to perfect the craft of writing. I also paid homage to the many bright, well-informed, and extremely talented authors of today. In the afternoon, Dr. Justin Patchin of UW-Eau Claire spoke on “The Growing Problem of Cyberbullying.” He presented current research on cyberbullying and noted that social networks and texting have opened doors to the good, the bad, and the ugly. Don’t be naive. Peer pressure can make even the best of children/students do things that are inappropriate. It’s up to us as parents and educators to keep a close eye on our children and keep the lines of communication open. The day ended with an exchange of ideas among the librarians. Two thumbs up for a great conference! I found gold! Gold in the form of love letters written long ago. While in Florida visiting my dad, he insisted I search the wall of boxes stored in the garage in order to find letters he and my mom had written to each other during World War II. This was not an easy task. My parents have saved everything from old ash trays to broken zippers. I should know. Each time I visit, I clean, dump, and organize closets and drawers. It’s a never ending job. The garage presented its own challenges. Think Florida. Think bugs – lovebug season. (I guess that’s why my dad wanted me to find their love letters.) Most of all think HOT! Even though my dad thought it was cold, I was HOT. He pointed to boxes. I lifted them, opened them, and returned them to the shelves when the letters weren’t found. The treasure hunt continued. I was exhausted and dripping like a faucet when I hit pay dirt. 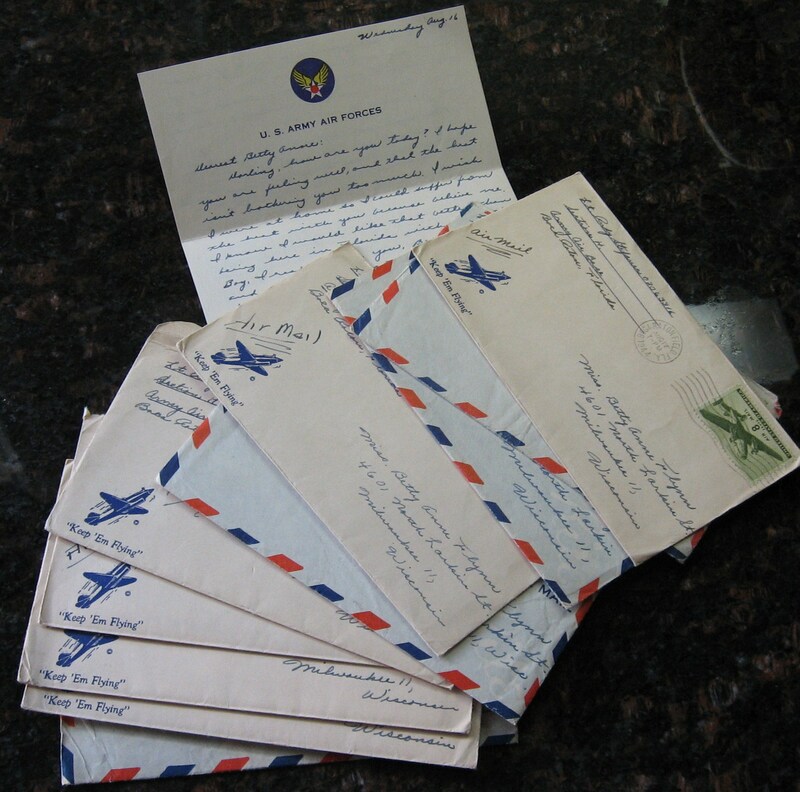 The box I opened was filled with letters – hundreds and hundreds of letters. Not only were there letters from both of my parents postmarked from 1942-1944, there were also letters from my grandfather to my grandmother before they married that were postmarked from 1921-1922. My dad was pleased at the find and happy to see the letters were still in good condition, considering where they had been stored. He wanted to make sure they weren’t destroyed so he told me to take them. It was quite a lot of the written word to ship home. I was awestruck, thinking of the history inside that box. I’ll be able to take a peek into the lives of my parents and grandparents when they were young and see them from a whole new perspective. It’s going to take me sometime to organize and read the letters, but I can’t wait to begin. The letters they wrote are a lost art, and I’m so lucky to have them!